Review posted January 8, 2015. Clarion Books (Houghton Mifflin Harcourt), 2014. 373 pages. Here’s a snowed-in mystery for kids with some non-traditional elements. It’s the start of Christmas vacation, and Milo was counting on some quiet down time with his parents. 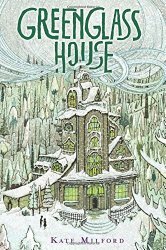 Milo’s home, Greenglass House, is itself something of a character in the book. Milo Pine did not run a smugglers’ hotel, but his parents did. It was an inn, actually; a huge, ramshackle manor house that looked as if it had been cobbled together from discarded pieces of a dozen mismatched mansions collected from a dozen different cities. It was called Greenglass House, and it sat on the side of a hill overlooking an inlet of harbors, a little district built half on the shore and half on the piers that jutted out into the river Skidwrack like the teeth of a comb. It was a long climb up to the inn from the waterfront by foot, or an only slightly shorter trip by the cable railway that led from the inn’s private dock up the steep slope of Whilforber Hill. And of course the inn wasn’t only for smugglers, but that was who turned up most often, so that was how Milo thought of it. Milo had lived at Greenglass House ever since he’d been adopted by Nora and Ben Pine when he was a baby. It had always been home. And he was used to the bizarre folks who passed through the inn, some of them coming back every season like extended family who showed up to pinch your cheeks at holidays and then disappeared again. After twelve years, he was even getting pretty good at predicting who was going to show up when. Smugglers were like bugs or vegetables. They had their seasons. Which was why it was so weird when the huge old bell on the porch, the one that was connected to the winch that drove the cable that in turn hauled the car up its tracks, started ringing. The whole family is very surprised to have a guest the first day of Milo’s Christmas vacation, especially on the afternoon just before a big snowstorm is forecasted. They are even more surprised when four more guests follow. None of the guests will give details about when they expect to leave. All of the guests are vague about why they are there. And the snow continues to fall. Mrs. Pine is quick to ask for help, so she goes out to the town for groceries and to get Mrs. Caraway and her daughter Lizzie to help out. Milo is frustrated by all the bustle when he’d expected a quiet vacation, so he hunkers down in one of his favorite places for when the hotel is full of guests, behind a high-backed loveseat. He got absorbed in the stories in a book one of the guests lent to him. But the spot wasn’t private enough, and that’s when he meets another important character in the book. Meddy Caraway looked as though she was just about as happy with this arrangement as Milo was. “Hello.” She yanked off her knitted cap, and static electricity sent her short reddish-blond hair shooting out like a spiky halo around her red face. Meddy is a bit annoying. Milo was looking at a chart one of the guests dropped. It’s a mysterious chart and looks like some kind of navigational chart, but it’s not of anywhere he’s heard of. Meddy grabs it and asks about it and all the guests coming at once, and she suggests that they start a campaign. Milo asks her what she means. Meddy chooses a character she calls Sirin. So they begin the game. And, right away, the chart disappears. This is where the book isn’t so much a traditional mystery. There’s no dead body. But some things are stolen, and Negret and Sirin work to recover the items and figure out who took them. But the main mystery of the book is finding out why each of the five guests from that first night came to Greenglass House. With all of them, it ties in to the history of the house itself, which was once owned by a famous smuggler, Doc Holystone. The mystery does involve finding out who the thief is, but there’s a lot more to it than that. Milo gets the guests to tell stories in the evenings (like the characters in the book he’s reading) and the tales intertwine in lovely ways. Meanwhile, ice and snow keep everyone at Greenglass House, each with their own reason for being there in the first place. Perhaps the biggest weakness in the book is the coincidence that all these characters arrived at the same time. Because most of the reasons for being there are quite different from each other. But since that’s the foundation, the beginning situation, it’s easy for the reader to go with the story… what if all these characters decided to descend on Greenglass House at the same time? This book is good for readers who enjoy a puzzle, but this puzzle has plenty of heart to go along with it, and interesting characters, and smugglers, and adventure, and hidden treasure.